After motivation from classical inequalities for real-valued martingales on the one hand, and the general theory of unconditionality in Banach spaces on the other hand, we introduce the central notion of UMD (unconditional martingale differences) Banach spaces. This chapter is primarily concerned with probabilistic implications and equivalencies of the UMD property, leaving the (harmonic) analytic side of the theory for the next chapter. 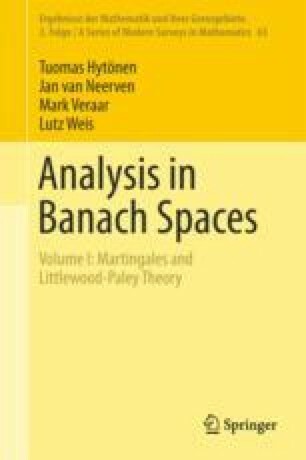 We also show that UMD spaces enjoy reflexivity, among various other nontrivial Banach spaces properties, and we prove Burkholder's characterisation of the UMD property by suitable concave functions, which leads to sharp constants in the fundamental martingale inequalities in the scalar-valued case.